Tel Aviv: A giant, grinning Donald Trump has been roped into Benjamin Netanyahu’s re-election campaign. As the April 9 vote nears, Israel’s prime minister is trying to move focus beyond the corruption allegations he faces to highlighting his strategic alliances and global stature. This month, he’s flying to Poland for a US-led summit, to Russia to meet President Vladimir Putin, and is said to be planning a visit to India, where his reception last year brimmed with flattering optics. 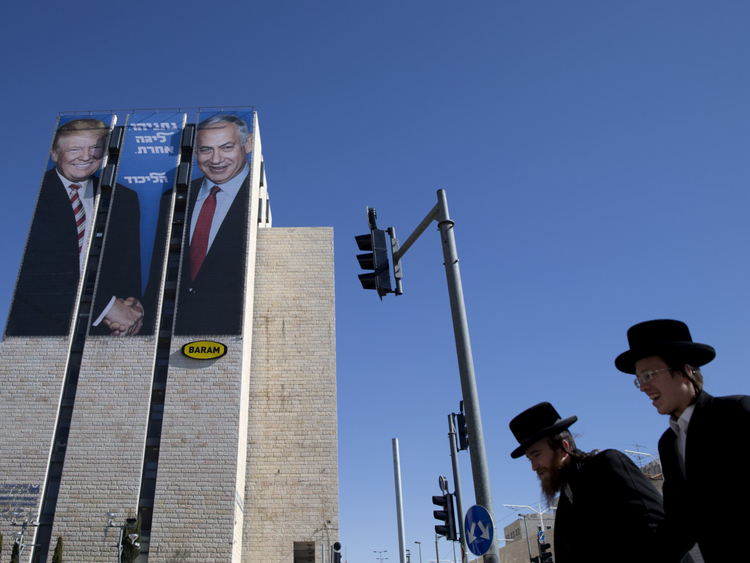 He’s also drawing on his warm relations with Israel’s most important ally: Huge billboards positioned on major highways show Netanyahu and Trump smiling and clasping hands, touting the prime minister as being in “a league apart” among Israeli politicians. Facing a former military chief in the campaign, Netanyahu’s pitch to voters that no one matches him when it comes to defending Israeli security is somewhat less convincing. He also has to brace for a possible indictment later this month by Attorney General Avihai Mandelblit in a sweeping graft probe. But no one beats Netanyahu at flaunting friends in high places. “He’s trying to show himself as a super leader and a super statesman,” said Gideon Rahat, director of the political reform program at the Israel Democracy Institute research center. This isn’t the first time Netanyahu has ramped up his travel schedule before elections. Two weeks before the last vote in 2015, he went to the US Congress—over President Barack Obama’s head—to blast the nuclear deal with Iran that was then taking shape. “When Netanyahu came back to power in 2009, it seemed that Israel was in political isolation,” said Eli Hazan, foreign affairs director for Likud. While polls have long showed the incumbent as the runaway favourite, Benny Gantz, the retired general who’s challenging Netanyahu, has reshuffled the deck. Respondents in at least two surveys in recent weeks have deemed the two men about equally qualified to lead the country, though Gantz’s Israel Resilience party is lagging Netanyahu’s Likud. Against accusations that he accepted gifts from wealthy friends and offered favours to media tycoons for sympathetic coverage, Netanyahu has kept his base intact, saying that trumped-up charges have emerged because no one can unseat him at the ballot box. At the US-led summit in Poland, which will focus on countering Iran, Netanyahu will huddle with representatives of the Trump administration, which has taken action on two issues he championed: moving the US embassy to Occupied Jerusalem and abandoning the Iranian nuclear deal. In Russia, he’ll make a case for ejecting Iran from Syria, where Israel has become more open about attacking Iranian assets. The prime minister’s office confirmed the Warsaw trip but had no further comment on Netanyahu’s other planned travels. The prime minister’s focus on diplomacy is shrewd because he also serves as foreign minister, and doesn’t have to share credit for his accomplishments, said political scientist Avraham Diskin, a professor emeritus at Hebrew University. On security or the economy, he can’t claim an advantage, but on diplomacy, “there are no partners,” Diskin said.